Age-Related Macula Degeneration (AMD) is a major cause of blindness in elderly people in industrialised countries. You can distinguish the atrophic (“dry”) and the exudative (“wet”) form, which is the most devastating one. Both are promoted by various environmental risk factors as well as the genetic background. The exudative form of AMD is characterised by the presence of choroidal neovascularisation (CNV). This CNV is triggered by an imbalance of angiogenic and anti-angiogenic factors in favour of angiogenesis. Most prominent molecules are the angiogenic vascular endothelial growth factor (VEGF) and the anti-angiogenic protein pigment epithelium-derived factor (PEDF). All these devastating processes are focused on the macula, the place for central and sharp vision in the human retina. The pathology of AMD starts with an impairment of the RPE (retinal pigment epithelium) cell layer. The reasons for this loss of function are not completely understood. Inflammatory processes, oxidative stress and genetic predisposition are possible causes for the degeneration processes that lead to blindness. The RPE cells are no longer able to fulfil their tasks to preserve a functional retina by sustaining the photoreceptor (RP) cells, supporting them with essential nutrients, regenerating the light-sensitive molecule opsin and disposing of waste products. Dry AMD waste products accumulate in and around the RPE cells, drusen develops and RPE cells die. The impaired RPE cell layer cannot longer preserve the RPs, which will degenerate next. In exudative AMD, Bruch’s membrane, a barrier of the outer retina, will become permeable and vessels from the choroid could penetrate the neuronal retina. The perturbed cellular metabolism leads to an imbalance of angiogenic and anti-angiogenic factors, promoting vessel growth in the retina, which lead to retinal degeneration and blindness (Fig.1 A, B). Fig. 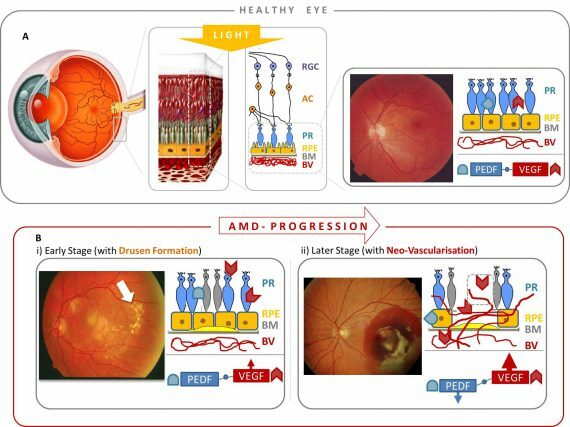 1: Illustration of the exudative AMD progression. (A) Sketch of a healthy eye with intact morphology (RGC: retinal ganglion cells; AC: amakrin cells; PR: photoreceptors; RPE: retinal pigment epithelium cells; BM: Bruch`s membrane; BV: blood vessels). (B) Demonstration of AMD Progression: i) early stage with drusen formation (light yellow) and ii) later stage with neovascularisation increased by VEGF and VEGF Receptor interaction. An imbalance of the intraocular protein composition promotes new blood vessel formation in case of VEGF dominance.